A selfie of First Daughter Malia Obama surfaced online on Monday which has sent the internet into a tizzy. 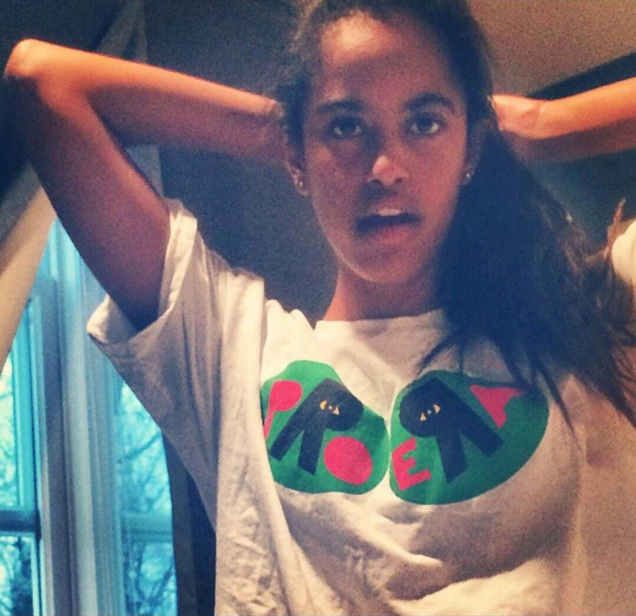 Malia wears a T-shirt repping Brooklyn-based rap collective Pro Era. Where this gets interesting for me, a founding member and frontman for Pro Era, Joey Bada$$ is St.Lucian. Not only was St.Lucia the backdrop of Joey Bada$$ video "My Yout" but watch his discovery of the island and its people. Watch the short documentary (below) of Joey Bada$$ visiting St. Lucia, the island his parents are from, to meet his grandfather for the very first time and to connect to the people on the Caribbean island. He had no idea of the open-arms reception and love he would receive from the youth. Joey Bada$$ told Gawker that "a mutual friend of Malia and a pro era member" sent the picture to Pro Era. As a comment on Pro Era's Instagram says, "From Flatbush Ave to the White House — now that's progress."